Tecno has just unveiled yet another device called Tecno Pouvoir 2. This device boasts of 5,000mAh battery capacity that claims to last up to 96 hours of use. Incase you don't know, Pouvoir is a French word that means Power. Aside the big battery, the Tecno Pouvoir 2 spots a big 6-inches IPS display with 720 x 1440p resolution, 4G LTE enabled, 13MP rear camera + 8MP front camera with flash, came running on Android 8.1 oreo which is powered by Mediatek MT6737 chipset coupled with 2GB of RAM plus 16 GB of internal storage. 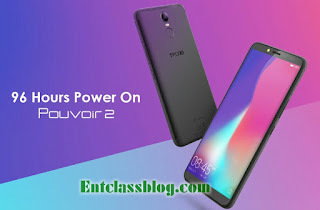 Price: Tecno Pouvoir 2 is priced at N47,000 in Nigeria. This phone is really nice,it has gotten good specifications. and it is not too cost.